‘Aka the Fire Ant Tracker’ is a free, 45-minute interactive presentation that addresses the effects and hazards of fire ants and inspires children to take an interest in current environmental issues. 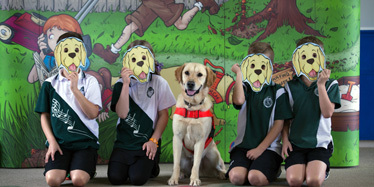 The presentation has been seen by over 10,000 Queensland school children per year. 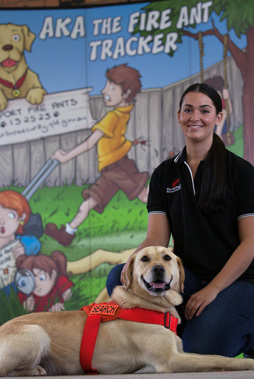 It features an odour-detection dog named Aka and his highly-experienced dog handler, Amanda. Aka demonstrates to students how he’s been trained to find fire ants in the field, with the help of volunteers from the audience – this is always a crowd favourite! We cater for 30-180 Prep to year 6 students per session on your campus, up to 2 morning presentations a day, for as many days as you need. Watch a 45-minute interactive presentation with ‘Aka the fire ant tracker,’ a 4-year old Labrador and his handler, Amanda. Amanda is a fully-qualified dog handler, current blue card-holder, and has been working with the Aka program for more than 5 years. Each student gets a free guidebook of fire ant information and an activity book filled with fun and educational activities that can be used in class or taken home to share with family and friends. You’ll have the opportunity to take a class photo with Aka, which makes for a great newsletter piece to share with the broader school community. We can also provide newsletter text to accompany your photo. We take care of setting-up and pulling-down so teachers can just focus on their students. All we require is enough space to fit the students and a 5x3m area for our presenter. Make a booking by calling 13 25 23, or book online. After watching the Aka the fire ant tracker presentation, 7 year old school student, Bailey spots a fire ant nest on the school grounds and raises the alarm. Fire ant general awareness training sessions are available for individuals and businesses that operate within fire ant biosecurity zones and deal with fire ant carriers.